The Director General of the Foreign Service, Arnold Chacon, at podium on May 1, 2015, requests that Gordon Murchie (left) and Carl Brandhorst (right), Presidents Emeritus of the Atlantic Seaboard Wine Association (ASWA), respectively, join him in giving a toast “honoring all past, present and future members of the U.S. Foreign Service and Foreign Affairs communities and their families who have served abroad promoting and defending America’s policies and its images, particularly during times of intense crises and in remote places.” The Atlantic Seaboard Wine Association has provided award-winning wines to accompany the annual Foreign Affairs Day luncheon, which is held in the elegant and historic Benjamin Franklin Diplomatic Reception Room atop the Department of State building. 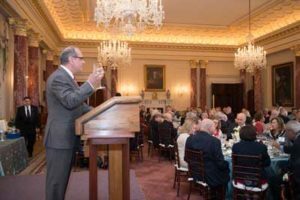 The luncheon is limited to 250 fortunate ticket holders, including invited senior government officials, out of more than 1,000 individuals, retired and active duty personnel, who attended the all-day program that included a morning status report on major worldwide issues challenging the U.S. by the Secretary of State, followed by mid-morning regional area briefings. Many distinguished members of the U.S. foreign affairs community attend. 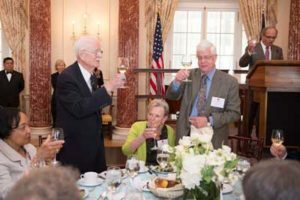 Seated between Murchie and Brandhorst is Ambassador Sally Cowal, who is the co-owner of Muse Winery, which was the winner of the 2015 Virginia Governor’s Cup Wine Competition. The person in the upper left hand corner is Chryss Hernandez who coordinates the annual FAD program. 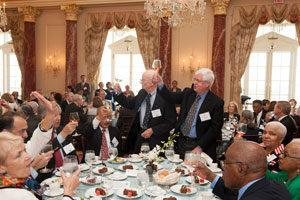 Joining the Acting Director-General of the Foreign Service in toasting all members of the U.S. Foreign Affairs Community and the 250 other individuals representing all facets of the American Foreign Affairs Community attending the 2014 Foreign Affairs luncheon in the Department of State’s elegant Ben Franklin Diplomatic Reception Room were ASWA’s Presidents Emeritus Gordon W. Murchie and Carl Brandhorst.